Theme for the week: Dads, of course!! Photo: This one was taken of my three guys around Christmas time. 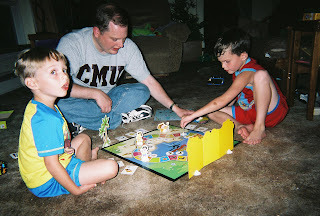 There they are playing a Backyardigans board game game. The old saying is that a picture is worth a thousand words. I hope this one speaks volumes as to what a great dad my husband is. Happy belated Father's Day Michael! We spent part of yesterday in "the Lorenzen mobile" (our minivan) traveling back from Ohio, where we had been since Thursday evening. Once home the boys remembered to pull out the presents with homemade they hidden two different closets. The gifts and cards can be attributed to our thoughtful babysitter who had them decorate mini trays with stickers. I feel the need to do something for the dad in my little family too. So the boys and I will go to the grocery store this afternoon to pick up items for a belated father's day feast. We will probably choose a small gift too. As for the grandfather's in our family; I put two geraniums on my dad's grave. It seemed appropriate because he always planted geraniums in front of his house. He also decorated the graves of several family members with annuals without fail every May. He still had a lot of decorations on there from his early May funeral. Since he died my step-mother has received a stack of cards that is about a foot tall. People loved and respected my dad. It's an honor to be his daughter. We took Grandma and Grandpa Lorenzen out to dinner to a Mexican restaurant for a Father's day and belated Mother's Day gift. Grandpa Lorenzen let my oldest, the one on the spectrum, pick out which place to go to. I'm surprised he didn't pick Subway, but then again he loves Mexican food too!! For the rest of the week I'm hoping to post about dads in regards to autism or people with special needs. If you have a favorite blog written by such a dad, let me know and I'll feature it. Hope all the dads out there had a very happy father's day! My husband wrote a great post about our daughter's diagnosis. You can link to it from my side bar. He never writes in his blog but I do love that post he wrote. Sounds good. Am planning to feature Joe's post on Wednesday--unless my recently obtained cold renders me unable.